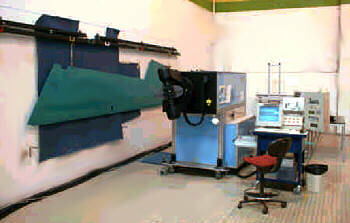 Aerospatiale Matra and Dassault Aviation have been using laser ultrasonic technology since 1994. The system used in a laboratory environment has proven to be highly efficient for inspection of complex geometry composite parts, monolithic as well as sandwich ones. The LUIS system was integrated in a shelter in 1997 to enable an easy transfer and extensive testing in various plant sites. It has then confirmed its good performances. The system was upgraded in 1998 to improve its capabilities with a high level of reliability. Extensive tests have been conducted in production environment at Dassault Aviation plant of Biarritz, and at Aerospatiale Matra plants of Nantes and Bordeaux. It has been possible to validate the use of the LUIS for testing a large range of parts, with a simple and easy set-up. Lately, the system was set up for a week in a maintenance environment at Mérignac, a Dassault Aviation plant close to Bordeaux. 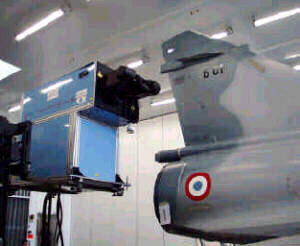 A Mirage 2000 was inspected, without any surface preparation. Several composite parts of the aircraft were inspected such as the elevon, the rudder and the vertical fin. Other tests on metallic parts such as a wing access door were performed. The LUIS has also shown a wide potential for corrosion detection as it was proven on a Transall corroded panel. The LUIS is now installed in a composite manufacturing plant in Biarritz, where it is used for production inspection. The advances of optical science should help to bring this amazing technology closer to industry use in the next future. To cope with the developments of new structures and to reduce the constraints and costs of non-destructive testing (NDT), aircraft manufacturers have to constantly look for and develop innovative testing methods. In the ultrasonic testing domain, the last 10 years have seen the emergence of numerous techniques: laser ultrasonics, R-TUIS, air coupled ultrasonics, phased array ultrasonics, etc. Validation and industrial implementation are about to be made or are already realised. Dassault Aviation and Aerospatiale Matra have been involved in the laser ultrasonic technology since the late 80's. Their discernment of the high potential of the technique led them to join up in a project focused on two main objectives. The first aim was the evaluation and validation of the technology capabilities on aeronautic structures. The natural follow-up of this approach was then the preparation of dissemination of the technique towards industrial units. The interest of the technology follows almost directly. The set-up of a laser ultrasonic system is very easy as no learning step is necessary. Without special preparation, it is possible to scan any geometry from a relatively flat wing panel to a complex geometry part, a leading edge or a beam. We will show this later through representative examples. There are some constraints to take into account. They mainly arise from the specific generation phenomenon. As the generation takes place in the material itself, the interaction between the optical beam and the material plays a key role. It implies that the laser characteristics, (wavelength, pulse duration) suit the material or coating. We have faced up to now two situations: for composite, CO2 wavelength appears as a satisfactory solution and for metallic it is necessary to work at very small wavelength, such as YAG 4?, to improve the optical coupling efficiency. At this stage, the first interest in laser ultrasonics has been focused on composite parts. Indeed, the developments in the aeronautic industry lead to large structures, integrating several functions and hence often presenting a complex geometry. This situation is certainly the most effective to benefit from a laser ultrasonic system. The experiments performed in the laboratory were carried out with two main objectives. The first goal was the characterisation of the generation and detection phenomena involved in laser ultrasonic testing. We achieved a better understanding of those phenomena, which helps us in the setting-up of new tests and enables us to have a fairly good control of the parameters. The LUIS system with the CO2 laser is directed towards composite materials. This configuration based on thermo-elastic generation has been mostly characterised. For the generation, the important points are the large spectrum of the ultrasonic waves (see Figure 1) and the strong directivity, perpendicular to the surface, of the waves (see Figure 2) for composite materials or coated parts. This ensures to work with L0 waves and to get a self-adaptation to the material with a range of frequencies suitable for both composite and metallic materials. The influence of the external layers has also been quantified. It appears that aeronautic paints are quite well suited for laser generation from both the optical coupling and thickness points of view. For the detection, the Fabry-Perot interferometer appears as a large bandwidth detection device. The important point regarding the sensitivity is the optical reflection diagram. Once again, aeronautic paints offer good reflectivity from 90° down to 30° angles. As it can be seen on the diagram below (Figure 3), the decrease is relatively slow, with an exception for the finish paint that is quite glossy. This provides good conditions for the detection. 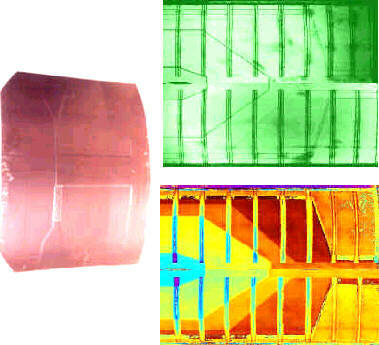 The evaluation of NDT performances has been conducted on standard samples, containing artificial defects. The interest was still focused on composite samples. A very good level of detection could be proven and the inspection time is similar, even better if the geometry is complex, when compared with conventional systems. The results presented in Figure 4 illustrate the performances of the technology. They were obtained on an ATR72 wing standard panel. This part is 940 mm x 615 mm large, with a thickness varying from 2,75 mm to 8 mm (not including the stiffeners). A large range of defects has been considered to realise this standard part. They are included in the skin and the stiffeners. All of them could be detected; the resolution is as good as what can be obtained with conventional systems. In this case, the acquisition step is 2 mm in both axis and the typical scan duration is 25 minutes. The second main phase of the project undertaken by the joint team consisted in validating the laser ultrasonic technique in an industrial environment. Moreover, as the technique offers a high potential for adaptation to production line or maintenance operations, it was essential to validate all aspects in real conditions and to evaluate what modifications would be necessary before introducing such a system in a plant. For the purpose of validating the system in various sites, it appeared quickly necessary to design a solution that ensured easy transfer. Consequently, it was decided to install the system in a shelter in order to set-up a mobile laboratory. The detection and electronic units are both fixed in the shelter. The generation unit is loaded in the shelter for transportation and can be moved around the shelter, using connection cables, for testing purposes. This installation is presented Figure 5, with the generation unit being unloaded. The shelter is mounted on a trailer. All units are fixed using specific dampers. Once this shelter configuration has been completed, it is very easy to move the system to any site using road transportation. The setting-up is quite easy as it only necessitates connection of the shelter to water and energy supplies; 2 people can make it in 4 hours. The system installed in the shelter has been moved and tested in various plants of Aerospatiale Matra and Dassault Aviation: Le Bourget, Nantes, Biarritz, Bordeaux. The applications looked for were maintenance as well as production. The products were aircraft and rockets. The range of tests included single structures and mounted parts as well. The performances shown by the LUIS system were at the same level than those demonstrated in the laboratory. The first point is the high flexibility of the system. All structures can be tested whatever their geometry and position are. This point is clearly visible when parts on an aircraft are concerned. On the Falcon 10, a business jet, and on the fighter Mirage 2000, wing surfaces, fuselage or stabiliser parts could all be inspected. The only supplementary means needed were a mirror and a forklift. The use of a forklift to have access to high areas is illustrated on Figure 6. It has also been used to inspect wing outer panels as an alternative to the mirror. For maintenance application, the laser ultrasonic technology enables to get scan results from any part. Moreover, inspection time is reduced compared to manual or semiautomatic testing. For the rare cases where it is possible to compare results obtained with conventional maintenance systems and LUIS results, the correlation is very good. The results obtained on the Falcon 10 wing panel are fairly representative. The comparison between the LUIS and a conventional C-Scan system (CURTIS) is shown in Figure 7. Impacts can be viewed on ultrasonic maps and the resolution provided by the automatic scanning system of the LUIS is better. For production application, the evaluation of the LUIS capabilities has been performed on parts tested with automatic systems and on parts involving manual testing as well. On curved panels, like the Airbus speed brake that presents surface discontinuities, it is possible to make a full scan of the part without facing any problem. In this particular case, due to the large size of the part, the testing has been made in two steps. 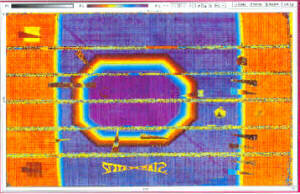 The variations in amplitude detected during manual testing can be mapped with a very good accuracy. When the comparison could be made with production scanning systems, the results were similar. On parts with a complex geometry, the level of analysis that a C-scan provides is matchless. Following the extensive validation of the laser ultrasonic technology conducted by the laser ultrasonic team for years, some limits were identified. They were mostly linked to sub-elements. Before the final installation of the LUIS system at Biarritz in spring 1999, Ultra Optec has made an up-grading operation. This up-grade aims to improve reliability in order to fulfil the production requirements and to achieve better performances. The two lasers have been modified and a self-focus system has been added in order to extend the working range of the system. The LUIS has been chosen by Dassault Aviation for technical as well as for economical reasons; the LUIS is able to test large parts with adequate detection performances. This is also one element for the cost reduction policy in the composite manufacturing. One of the composite part which is now inspected with the LUIS is the new Falcon rudder carbon fibre skin. 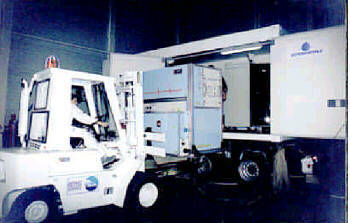 The LUIS, as the scanning unit is mobile, enables the testing of the structure in several areas. A typical configuration is presented in Figure 9. The Figure 10 shows a typical printout C-scan obtained with this part. The economical goals have been achieved; no special handling tools are requested, and inspection cycles are significantly reduced. From the production point of view, the further necessary improvements will focus more on the automatic inspection process than on the LUIS performances. For example, batch scanning and off line data processing will be considered. The LUIS has been qualified for several other types of composite parts and will progressively replace previous scanning contact systems. Through our now 6 years of evaluation of the LUIS system, including the 18-month long experience in production, the benefit of laser ultrasonic technology has been demonstrated for aeronautic structures. Although the system is still very bulky, the technology has been judged mature enough to be used for production inspection of parts. The potential for maintenance testing is interesting as well. The optical industry is currently being developed rapidly. This implies that the potential for improving the laser ultrasonic technology is very high. Unfortunately, though many laboratories throughout the world work on new applications of the technology, there is little work being done on the development of new and more efficient systems. This will certainly delay the dissemination of this amazing technology in the industry. C.B. Scruby and L.E. Drain, "Laser Ultrasonics, Techniques and Applications", New York, Adam Hilger, 1990. O. Pétillon, J-P. Dupuis, D. David, H. Voillaume and H. Trétout, "Laser Ultrasonics: A Non-Contacting NDT System", Review of Progress in QNDE, Volume 14A, pp 1189-1195, 1995. M. Choquet, R. Héon, C. Padioleau, P. Bouchard, C. Néron and J-P. Monchalin, "Laser Ultrasonic Inspection of Composite Structure of an Aircraft in a Maintenance Hangar", Review of Progress in QNDE, Volume 14A, pp 545-552, 1995.